Saw this earlier tonight at a parking lot at Sunset Way. 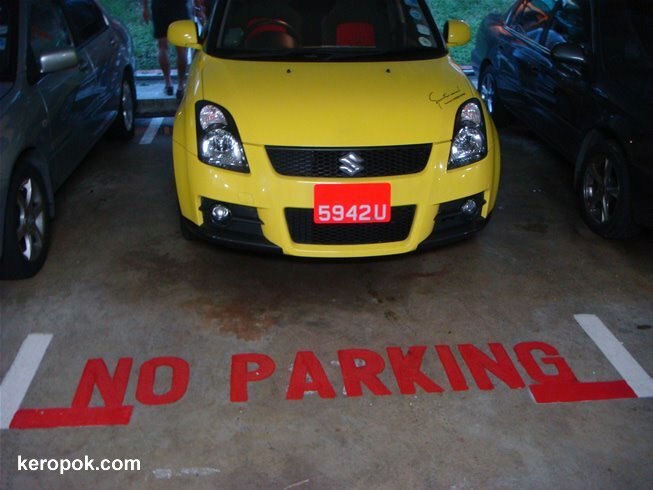 Do you think the driver parked there because he/she did not see the "No Parking" sign? Or he or she gets the kick out of parking in a lot that has "No Parking" on it. Maybe I fell into his/her trap. I took a photo of it and that might be what they are hoping for! LOL. Does this happen frequently in your city too? In most carparks here, your car will be clamped if you simply park in non-parking zone. You will have to pay a compound of RM50 (at least) to get your car released. It's too expensive a lesson for me so I will not simply park my car. This is actually a good method to deter such offence from happening.